It would also repeal virtually all the tax increases imposed by the Affordable Care Act to pay for itself, in effect handing a broad tax cut to the affluent, paid for by billions of dollars sliced from Medicaid, a health care program that serves one in five Americans, not only the poor but almost two-thirds of those in nursing homes. The bill, drafted in secret, is likely to come to the Senate floor next week, and could come to a vote after 20 hours of debate. Senator Chuck Schumer of New York, the Democratic leader, held a news conference at which he criticized the Republican health care bill on Thursday. If it passes, President Trump and the Republican Congress would be on the edge of a major overhaul of the American health care system — one-sixth of the nation’s economy. Mr. Trump shares that view, and the Senate bill, if adopted, would move the president a great distance closer to being able to boast about final passage of a marquee piece of legislation, a feat he has so far been unable to accomplish. Senate Republican leaders unveiled their health care bill on Thursday. Democrats and some insurers blame the Republicans and Mr. Trump for sabotaging the law, in part by threatening to withhold subsidies used to help pay for deductibles and co-payments for millions of poor people covered by the law. In the Senate, Democrats are determined to defend a law that has provided coverage to 20 million people and is a pillar of former President Barack Obama’s legacy. The debate over the repeal bill is shaping up as a titanic political clash, which could have major implications for both parties, affecting their electoral prospects for years to come. Mr. McConnell faces a great challenge in amassing the votes to win Senate approval of the bill, which Republicans are trying to pass using special budget rules that will allow them to avoid a Democratic filibuster. But with only 52 seats, Mr. McConnell can afford to lose only two Republicans, with Vice President Mike Pence breaking the tie. He may have already lost one — Senator Rand Paul, Republican of Kentucky, has indicated repeatedly that the bill is too liberal for him. Democrats are unified in opposing the repeal efforts, and they have already assailed Republicans for the work they have done so far, criticizing them for putting the bill together without a single public hearing or bill-drafting session. In the short term, the possible electoral consequences are more muted in the Senate than in the House, as only two of the Senate Republicans who face re-election next year, Dean Heller of Nevada and Jeff Flake of Arizona, are seen as vulnerable. But Republican leaders still must contend with internal divisions that will be difficult to overcome. Numerous Republican senators from states that expanded Medicaid are concerned about how a rollback of the program could affect their constituents, and they face pressure from governors back home. 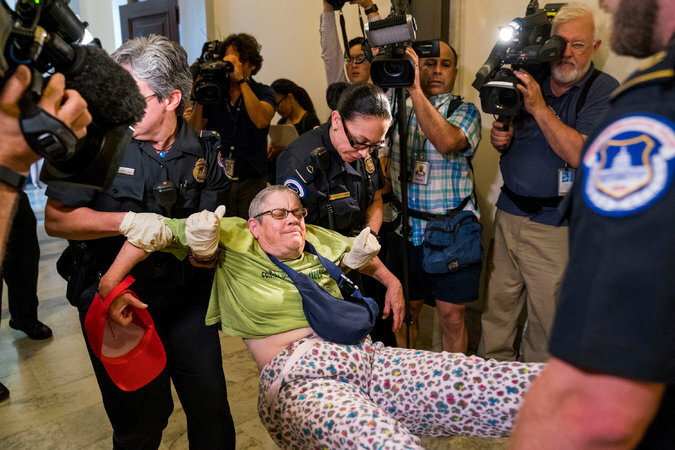 United States Capitol Police officers removed protesters from outside Mr. McConnell’s office on Thursday. Some senators have concerns based on other issues specific to their states, including the opioid epidemic that has battered states like West Virginia and Ohio. And some of the Senate’s most conservative members could resist a bill that they view as not going far enough in dismantling the Affordable Care Act. Senators will not have long to sort out their differences. Mr. McConnell wants to hold a vote before lawmakers return home for the Fourth of July recess. If the repeal bill is still looming over the Senate, Republicans are certain to face intense pressure from constituents who wish to see the Affordable Care Act remain in place. The assessment being made by senators will be shaped in part by an analysis of the bill to be released by the Congressional Budget Office, the official scorekeeper on Capitol Hill. The budget office found that the bill passed by the House last month would leave 23 million more people without insurance in a decade. 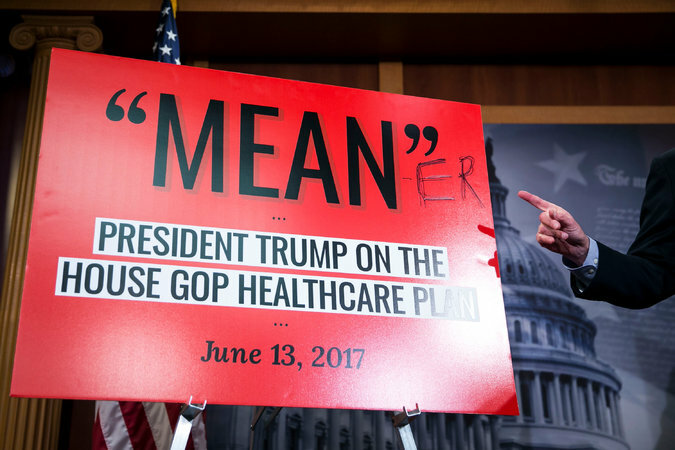 Mr. Trump recently told senators that the House bill was “mean,” though weeks earlier he had celebrated its passage.